Sedum Plants such as Sedum 'Autumn Joy' are a popular low care succulent sold widely for use in both containers and in the garden as a groundcover plant. Look for species and cultivars for sale including Sedum telephium 'Autumn Joy' (see picture right) and Sedum 'Purple Emperor?' or the Autumn Stonecrops, two of the many sedums popular in gardens across the USA. Sedum rupestre 'Angelina', Sedum spurium ( a creeping groundcover) the early white flowering Sedum ternatum and Sedum kamtschaticum are other sought after species. Sedum plants require varying degrees of care depending on growing conditions. We suggest leaving the old foliage and spent flower heads on the plants until winter, especially in cooler areas. Leave pruning back until spring, which is also a good time to apply some mulch. 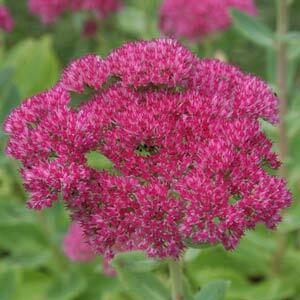 Sedums require little extra care during summer other than some water during particularly dry spells. Older clumps can be divided in spring. Sedum telephium 'Autumn Joy' is a taller growing species reaching 2ft in ideal conditions. Flowers form late summer and hold well through fall. Some confusion exists with sedum names, rupestre and reflexum often refer to the same species. Sedum rupestre 'Angelina' is a good low growing ground cover with golden yellow foliage, drought tolerant once established. Sedum reflexum 'Blue Spruce' with it's blue green foliage is another low growing mat forming ground cover plant as is Sedum spurium. Sedum kamtschaticum also has a variegated form. Sedum 'Matrona' is a tall growing upright Sedum reaching a height of 2-3ft. Sedum 'Matrona' has nice deep red stems and green foliage. Light pink flowers on large flower heads in late summer to fall. A drought tolerant sedum that needs a well drained position in full sun. This clump forming perennial needs little care once established, water once every week or two in very dry periods, cut back old dead growth in spring when new shoots appear. Sedum 'Matrona' can be divided in early spring if required. All are low growing and make excellent ground covers. Sedum Plants are available for sale from the following nurseries. Evergreen flowering ground covers, grasses, vines, ivy, ... Free Shipping of over 150 varieties of quality groundcovers. Mailorder, retail and wholesale. Open on site on Fridays and Saturdays in spring and fall where we offer a full range of herbaceous material.